At long last, Super7 once again has Mummy Mania! The winning entries to the 2012 Mummy Mania Custom Toy Show and Contest have been faithfully reproduced as limited edition figures. Gian Marayag’s custom Saturday Night Special Mummy Boy is cast in dark charcoal grey vinyl with soft sprays of army green, maroon, light grey and gold sprays with a soft satin matte finish, just like the beautiful original. 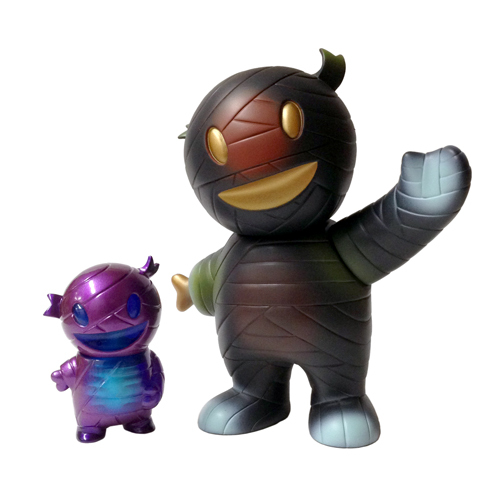 This full size Mummy Boy joins forces with his pint-sized pal, Eckotyper’s Spinal Fusion Pocket Mummy Boy! This little fella proves he has nothing to hide, with his metallic purple sprays revealing his glow-in-the-dark resin skeletal system through unpainted clear blue vinyl areas on his belly, eyes and mouth. Both the Full-Size and Pocket-Sized Mummy Mania creations will be available for $50 and $35 respectively, Thursday, August 29th, 12Noon PST.